I love to read stories from other mum’s about their experiences of being a new mum. So I am putting together a little guest post series called New Mum Stories where anyone can write about their own experiences as a new mum. They can be stories of years gone by about becoming a mum for a first time, or if you are a very recent new mum. Got a funny story about being a new mum? I would love to hear all about it! They can be happy stories, challenging, sad, hilarious, anything goes really. I would love to read and share them with my readers. The stories will go live on the weekends and linked back to your blogs as well as tweeted using #NewMumStories So when you send me the post please add your blog and social media links. You can add photos as well if you wish. The posts will go live in the order I receive them. Please also send your posts to the above email. 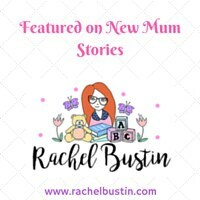 You can grab the featured on New Mum Stories Badge to add to your blog.